Some people stick by the “eating less” advice to maintain their weight. This will help them consume lesser calories than their bodies need. But for those who can’t seem to follow this mantra, there is another option available- slowing down your eating speed. A recent study conducted by researchers from the Department of Kinesiology at Texas Christian University suggests that eating slower may help lessen the calories that people consume. This can help them trim down their waistlines in the process. But the way it works may be a bit more complex than what people may expect. Obesity is a growing problem in the US population, increasing to 35.9 percent of the population in 2009-2010 compared to just 14.5 percent in 1971-1974. One contributing factor is said to be an increase in energy intake. Research also suggests that energy intake may also be affected by eating speed. A high eating rate may impair the relationship between the processes and sensory signals that regulate how much we eat. In order to further investigate the relationship between energy intake and eating speed, the researchers looked into how eating speed affects the calories consumed during a meal in both normal weight subjects and obese subjects. 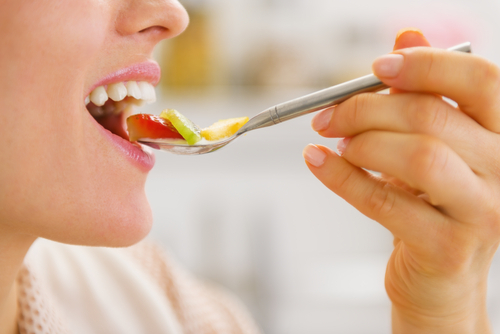 In the said study, all the subjects were instructed to eat one meal at a slow speed, taking small bites, chewing thoroughly, pause and put the spoon down after each bite, and eat without any time constraints. They also were made to eat another meal at a faster rate, taking large bites, not putting the spoon down and imagine that there is a time constraint. The researchers also collected data on water consumption during meals as well as on the feelings of hunger and fullness before and after a slow-paced and fast-paced meal among the subjects. In addition, both groups consumed more water during the slow meal as compared to the fast meal. The participants consumed around 12 ounces of water during the slow meal while only taking in 9 ounces during the fast meal. The added water intake during the slow meal may also have affected food consumption. The researchers indicate that how people approach food consumption between different weight groups may also affect how they can control energy intake. “Slowing the speed of eating may help to lower energy intake and suppress hunger levels and may even enhance the enjoyment of a meal,” Dr. Shah further added. Source: Elsevier. “Slower-paced meal reduces hunger but affects calorie consumption differently.” ScienceDaily, 30 Dec. 2013. Web. 3 Jan. 2014.